Daniel and Ashley are passionate about whitetail hunting. Even when the season is over they are out their prepping for the next year. They are showing the realities of whitetail hunting specializing in the Southeast. Daniel’s Grandfather introduced him to whitetail hunting when Daniel was just a child. He would play his Gameboy in a makeshift blind until his Grandfather would point out a deer and ask if he should shoot it. When Daniel was finally old enough to harvest a deer, he would end up harvesting a fox and a coyote before getting his first deer. The running joke was his Grandfather was going to send him to the blind with a picture of a deer in hopes he would come back with a deer and not another species. Ashley was introduced to whitetail hunting by Daniel 5 years ago. Her main objective was to spend more time with her husband and he was nervous and skeptical on taking her hunting. Her first season hunting she was able to harvest a 6-pointer with a rifle. From that moment she was hooked and has been hunting ever season since. About 3 years ago she decided she wanted to try out bow hunting, but it seemed like her nerves could not stay calm enough to harvest a deer. It took some time, but she stuck with it and has successfully harvested deer with her bow. 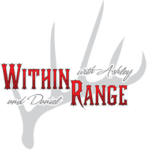 Together they enjoy getting more people especially women and children involved with whitetail hunting. So, guys take your wife, fiancée, or girlfriend out hunting with you. Dad’s take your son, daughter, even your niece or nephew hunting. Education them on safety and hunting conservation.